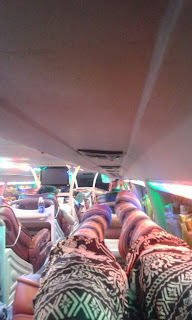 Google 'sleeper bus Vietnam'. I guarantee you will not feel particularly inspired to try this form of transportation which has been described as “It's sort of how I would imagine taking off in a rocket ship to mars would feel like non stop for 12 hours” or similar by the numerous blog posts and articles. So, I will hereby share my own experience about sleeper buses. Which, I must say, was nothing as horrific as most blog entries/articles you see. But it certainly was not without its... quirks. Four bus reservations. Seven days. Three passengers. (Myself, the famous Hayzybobzykins (see NZ entries for more info <3) and her friend Steffy) One misplaced booking confirmation receipt. Sleeper buses have three rows of single seat/beds. Granted they are not idyllic for the most serious sufferers of claustrophobia, but I was able to just about have my legs straight in the little cubby hole in front of me while being reclined maybe 150 degrees. TRIP NUMBER 2: Dalat-Nha Trang did not start well – we rocked up to the tour office, told the lady we were booked onto the twelve o'clock bus, to which she replied: "Nope, it's fully booked.” So a moment of explaining to her that we are part of the booked bus, her promising to do something about it and then proceeding NOT to... But I guess she got tired of our impatient sighs and in the end wrote us tickets onto this bus which did not turned out to be fully booked after all. But apart from that, it was by far my favourite - I knew Dalat was hilly, but I did not expect such a stunning mountain pass road out of it. From pine trees at the top to palm trees at the bottom. Beautiful. 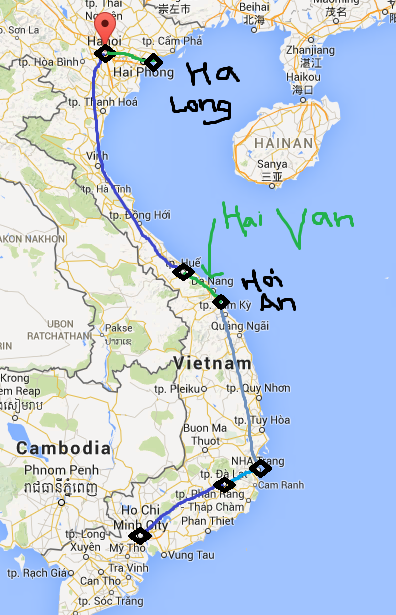 TRIP NUMBER 3: Nha Trang-Hoi An was our first Official Night Bus. We had about forty-five minutes in Nha Trang, the Russian beachy party-vibed holiday paradise, where we took a few jump pictures on the beach, dreamed of trying out the epic-looking cable car (it looked as if it was held up by mini-Eiffel towers... One day, I'm going back. Mark my words) and eating a quick dinner. Then back to find the bus. Which was obviously late. We waited and waited along with mostly other backpackers, until finally the conductor man started shouting something in Vietnamese that some started reacting to. I walked over to him, showed our ticket, and he, clearly very busy and stressed, pointed me hurriedly over to a bus waiting down the road, with many people around it. 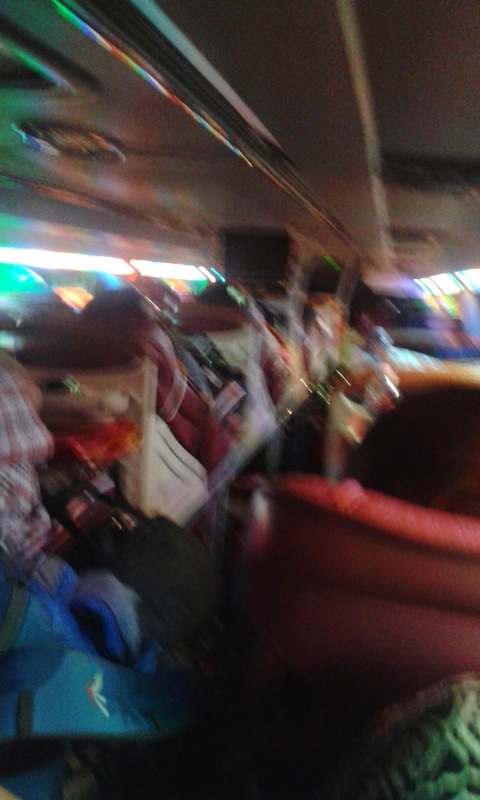 We got to the bus which was by now half-full, people getting on, and luggage being put into the bottom boot. (Ok, what is it called, that place where you put your bags in a bus??) All very stressy, unorganised and hurried. Suddenly the conductor dude started shouting something. The bus suddenly closed its doors, the luggage boot door thing was slammed shut, and the bus started leaving. Ok, not our bus after all.......? I vaguely thought watching it go, after checking with Hayzybobzykins that they hadn't yet put any bags in. Luckily not. A bit more distressing, however, for people who had loaded their luggage, but not themselves, or people whose travel companions had got on before them. Well, in the end the bus just moved onto the pavement (blocking half a road is clearly not always acceptable even in Vietnam), so luggage and people were reunited. We squidged onto the bus, and luckily managed to find our top bunk beds at the front of the bus quickly. We scrambled up onto them, and settled down uncomfortably onto our beds, watching other people getting on the bus and, well, being distressed. The aisles are just about wide enough for one person. So, when someone who had got to the far end of the bus found out that she was on the wrong bus, everyone (stressed, unhappy backpackers mostly, with awkward bags and boxes of cold pizza) was expected to reverse gradually back down the aisle, and off the bus for this one person to get off. This situation was not assisted by a French couple refusing to get off the bus, and the Very Loud Canadian who had started a conversation with a dude on the bottom bunk and failed to notice that people were waiting for her to reverse until the conductor dude started loudly shouting at her from the back of the bus. After this, he literally climbed over a random man on the bottom bunk to get to the other aisle. The bus ride itself was ok, not massively sleepful due to coldness and sickness, nor the multiple stops we made to pick up MORE people. Since there was no more free seats, they put people to lie in the aisles with a duvet and pillow. And when there was no more space they had people sitting in the aisles. Hello Vietnam. 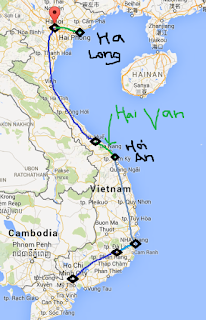 TRIP NUMBER 4: Our final night bus was Hue to Hanoi. We were even picked up from the hotel, so things were looking good. I was happily planning an entry where I'd warmly recommend sleeper buses – yes, granted Nha Trang hadn't been the Most Organised Event in the world, but nothing had gone massively badly wrong. ANYWAYS. We never got to any sort of tour office, where night buses usually left from. We stopped somewhere, were all but thrown off the pick-up bus, and all but thrown onto the night bus. We didn't have tickets (every other time we had got the tickets when we got to the tour office) but happened to be the first on the bus, so they waved us to the dreaded back seats. The horrific five seats together, instead of three seats with two aisles in between. We had some of our bags with us, while some of them we had been told to dump on the ground before being forcefully ushered into the bus. The usherer-dude had no interest in life except practising his best “khong”, the infuriating Vietnamese hand-wiggle which can mean anything from “I don't know” or “I don't understand” to “No” or “Can't be arsed” or “Unfortunately not possible right now” or “You're foreign”. Next, we found out the painful way that the seat in front of Hayzybobzykins was broken. (It wouldn't stop reclining.) Infuriating hand-wiggler dude was summoned, but he was obviously much too focused on hand-wiggling. (Except when he attempted to physically stop Hayzybobzykins from getting out the bus to check the whereabouts of the luggage last seen on the ground next to the bus.) We successfully shooed a lady away from the broken seat, but less luck with the next passenger – a large French man who appeared to think that broken seats would magically fix themselves when he states loudly that he has a bad back. The staff was extremely rude. A lot of rudeness can be forgiven in this country due to cultural differences, different priorities etc, but this staff was downright impolite. It was a hilarious situation, but simultaneously I was disappointed for the Reputation of Sleeper Buses – suddenly my image of them was less rose-petalesque as previously. Interestingly though, after the initial faff, all three of us managed quite a good night's sleep on the bus. A few jolts awake (with or without the banging head on the bus ceiling) when the bus bumped over an especially bumpy bump, but what seemed like a very short time later, we awoke to Hanoi bus station. Fresh and ready to be scammed by a dodgy taxi driver. All in all, night buses = an experience. You have to experience for yourself to find out if they are your cup of tea. I think I will stick to flying next time, but I am very happy I got to have this Traditional Vietnamese Experience. If for nothing else, the mountain road outside of Dalat and the Nha Trang conductor's confession of love made it all worth it. Unbelievable! Do they have sleeper buses in other countries? I'm so glad H. had her sleeper socks with her!